GE Healthcare unveiled a cloud-based solution that will enable radiologists to share images and protocols and provide access to advanced applications as a fee-for-service. GE Health Cloud is a scalable, elastic, and reliable cloud ecosystem to deliver GE Healthcare software applications “as-a-service,” accessible via the Internet and offered on a subscription basis. According to the company, it is designed to address the unique requirements of the healthcare industry, including managing the volume, velocity, and variety of healthcare data, such as complex 3D imaging data, in a secure, HIPAA-compliant and gated community cloud environment. Built on existing technology from the Predix Cloud, GE’s platform for the Industrial Internet, GE Health Cloud integrates with existing clinical workflows to provide on-demand access, remote monitoring, asset connectivity, machine data support and industrial-grade security and compliance. Users will be able to connect their imaging modalities to the GE Health Cloud to leverage advanced imaging algorithms in the cloud across the company’s entire portfolio, including Ultrasound, MR, CT, and PET. A key component of the GE Health Cloud is its ability to host healthcare-specific applications developed by 3rd-party independent software vendors (ISVs). GE is highlighting two of these applications, NeuroQuant (from CorTechs Labs) and Arterys, which are both expected to be available through the GE Health Cloud in 2016. NeuroQuant is a quantitative MR solution that automatically segments and measures volumes of the hippocampus, ventricles and other brain structures and compares these volumes to norms, further reducing the subjectivity of the diagnosis process. By using the cloud-based Arterys software, the company can launch new algorithms that allow large datasets to be evaluated in real-time and reduce the amount of time spent on data processing and new visualization tools. 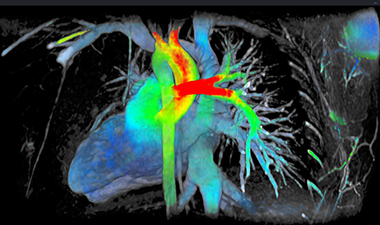 This includes ViosWorks, a cardiac MRI solution that captures seven dimensions of data (three in space, one in time, three in velocity direction) to deliver a three-dimensional spatial and velocity-encoded dataset at every time point during the cardiac cycle. The free-breathing scan, typically acquired in less than 10 minutes, yields high resolution, time-resolved images of the beating heart and a measure of the speed and direction of blood flow at each location. Additionally, Centricity Cloud Advanced Visualization will leverage the power of the cloud to provide 3D imaging and advanced post-processing tools for clinical use on-site and at remote locations along with interactive tools such as luminosity adjustment, zoom and rotation. Anticipated release of this new visualization solution is expected in Q2 2016. RSNA 2015: GE launches Health Cloud for clinical collaboration with fee for service apps. Appl Radiol.